If you haven’t noticed (quick, buy a card! ), today is Valentine’s Day, the day of love. This really made me want to get on a plane right there and then and get to the Vatican! I can’t get there at the moment, but Sandi mentioned a book she’d borrowed from the Vatican Archives while she was there, a German book with photographs and transcripts of all of the letters. I’d only ever seen a photograph of one letter so I made it my mission to track down this book and I was able to buy a copy from a bookshop in Germany. I was so excited when it arrived and although photographs can never do justice to objects like this, I too was blown away by the difference between this letter and the others in the collection. I can’t see where the quill went through the vellum, but I can see darker areas of ink, smudges and splatters – some of the splatters are not ink and I wondered if they were even tear stains. It really is a mess compared to the usual neat and beautiful looking letters. It is the appearance, rather than the words, that tell of Henry’s love for Anne. This was more than lust, this was a distraught man worried about the woman he loved with all of his heart. 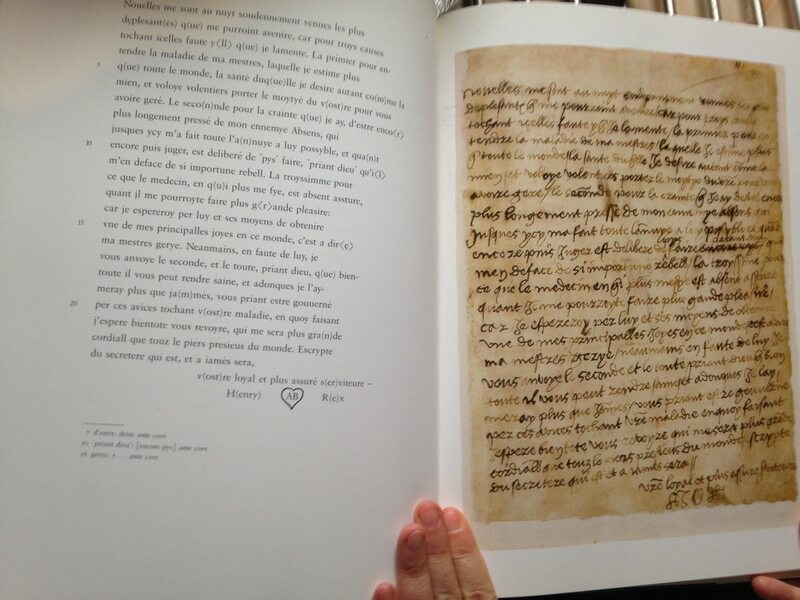 Here are photos of two letters written by Henry VIII to Anne Boleyn, the second being the sweating sickness letter. You can click on the images to make them bigger. “Sandra Vasoli on the love letters of Henry VIII”, talk on 6 January 2015, The Tudor Society. “Henry VIII’s Love Letters to Anne Boleyn – The Sweating Sickness Letter”, video by Claire Ridgway, 30 January 2015, The Tudor Society. Die Liebesbriefe Heinrichs VIII an Anna Boleyn, Theo Stemmler. Claire, thank you so much for posting pictures of those letters. As I was reading through the article I kept thinking “I wish I could see that letter, even just a picture of it”… Then there it is 🙂 thank you! That’s ok! I was so excited when I received the book with all the photos in it. I, too am so grateful you included the photos! It’s a lovely gift to us, your fans and Anne’s too. Thanks. These are so beautiful! It’s hard to believe that a man so in love could turn so cold as to behead his beloved. Then again, pain, jealousy & pressure from outside sources can have a profoundly negative affect on one, whether king or commoner. It depends how you define love. No doubt Henry had strong feelings for Anne and he turned heaven and earth upside down to posses her. But his love was, as always, conditional. When they married, Anne had to bear a son and change to a complete different person she was, a humble and submissive wife. Henry was not capable to love a person as she was, with her own free will, nor could he realize that if you live with somebody, you cannot idolize her any more but, accepting her failings as well virtues, you can see, and love, a real person at last. First of all, many people at the time saw it as love. It is kind of hard to question a man who waited 7 years for this woman as anything less than being in love. Secondly, he did not set the conditions. They were the conditions of royalty. You get the pleasure but you have to do the job of providing for the security of the country, your inheritance, and that, in those days, meant sons. Passion doesn’t last. Henry made a huge mistake. Especially if she was guilty!!!!!!!!!!! Yes, there are also nowadays men who kill their wives out of jealousy (invented or real) or because she wants to leave. But are these men really normal and sound? Of course not. There have been other queens who had been guilty of adultery or even revolt, but they had not been killed, only their lovers. But their husbands didn’t move heaven and earth for 7 years to marry them because they were in passionate love. These Princesses did not smear their husband’s sexual and artistic reputations, and they were Princesses of blood. More to the point, if Henry truly *believed* she was guilty at the time of her death…which I believe he did. Might it be that the sloppiness of Henry’s writing was the result of one tipple too many? Might it be that Henry’s antic behavior and low fertility be attributed to alcoholism, increasingly so as he aged? There seems to be little reference to this affliction among medieval and later nobility while alehouse drunkards were a common source of ridicule. Wow, you really can see the difference in the writing… the second letter is written with haste, passion and without premeditation. So wonderful to see them alongside each other. Thanks for posting these Claire. I wonder how much those letters are worth, wouldn’t I love to hold one in my hand. 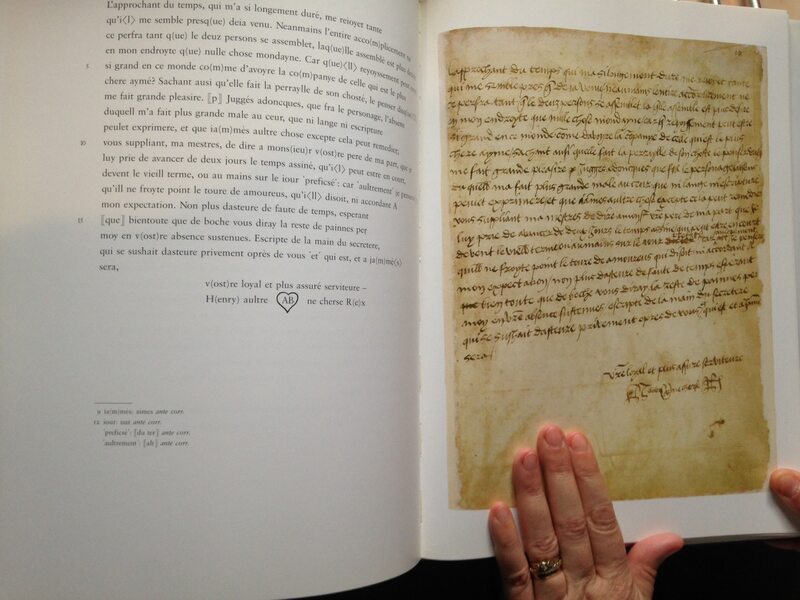 I just finished reading Je Anne Boleyn and so seeing the letters that inspired her to write the book was a treat! Thanks so much for sharing. Now if only we could find Anne’s responses to those letters! That is an amazing letter. I think this shows his agitation over Anne’s health. Thanks for showing it. just finished reading Life Death Ann Boylen it’s no wonder he fell for this remarkable women !!! Such a beautiful love story gone in to legend !! She must have been devaerstated when she was put in the Tower I know I would have been and a bit confused cos she obviously didn’t know what she had done !!! 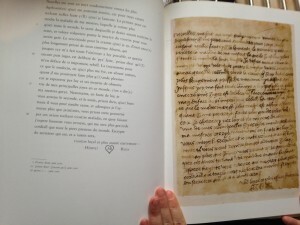 I have seen the letters on the website a few times, but nothing could beat seeing them in the flesh; you must be able to see all of the marks, blots, possible tear stains and just the actual thrill of being in the presence of such rare documents; wow! Come hither young lovers wherever you are! Lines from a famous song, I love Valantine Day and although I have not been out yet, we are having a belated date tomorrow at my favourite bar La Flavia. 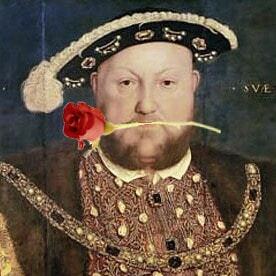 I love the picture of Henry with a rose in his teeth. Cool. It really is odd that these are in the Vatican. Wonder if they will be sent back to England by the time of 500th anniversary of Anne’s execution. They could come on loan. Copies have been made before for special exhibitions, but I personally believe that the Vatican Library will remain as their custodian. But you never know.